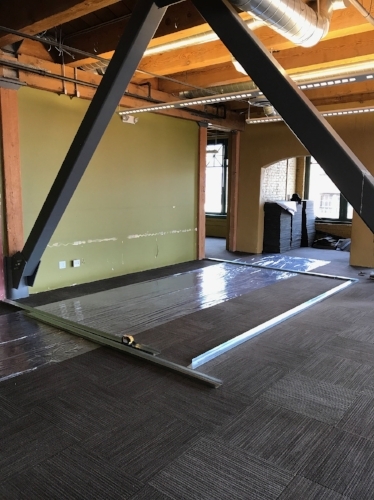 Colvos Construction is doing tenant improvements for Infoblox to expand its office in downtown Tacoma. President Devin Page answered questions from the DJC about his new construction company, which was named after Colvos Passage in Puget Sound. Q: You are a new firm. What is your background? A: Anders Bjorn, Colvos Construction vice president, and I have been in commercial construction in the Puget Sound region since the early 2000s. We began our careers as project engineers for growing and large-scale companies, including Skanska, Turner and Andersen, which is where we first worked together. Anders was a project manager in the emergent special projects division that I was responsible for growing. In 2013, I left Andersen to lead the construction arm of a South Sound developer and increased its revenue and staff size by 300 percent. Participating in the strategic deployment at the executive level for established companies has given me the skills to develop and run a successful construction company. Our combined experience shapes the strategy that we live by at Colvos Construction: Bring on the most talented team members in the region and focus on adding value for our clients. Q: What are the biggest issues in your industry? A: There’s fewer subcontractors available than in the last economic cycle, which we feel results from an exodus of skilled labor during the recession and a lack of positive outreach from the trades to millennials. Likewise, local universities produce a fraction of construction management graduates that were produced in previous decades, creating a hiring frenzy for competent superintendents and project engineers. The result is severe cost escalation, schedule delays and talent entitlement. We mitigate this challenge by working with subcontractors we know and trust and by hiring only reputable, vetted team members. Q: In which sectors are you seeing, or expect to see, growth or a slowdown? A: Multifamily and mixed-use will continue to dominate the market, but we anticipate a change in popular development project types. Since many of the larger sites have been built in this cycle, we see infill projects and renovation of B and C product in the urban areas of Seattle and Tacoma becoming more attractive to developers. Senior housing and assisted living will also continue sharp growth rates, as more national operators enter the region. Q: How has design-build changed how jobs get done; where are you using it? A: Design-build effectively reduces the risk of last minute cost escalation to the owner. Not only are the design and engineering consultants involved from the onset of the project, but so are the subcontractors, allowing us to proactively identify and mitigate any future pain points in construction. Typically on our multifamily projects we design-build the shoring, plumbing, fire sprinkler, HVAC, electrical and fire alarms. Q: How are rising land costs in Seattle affecting what gets built? A: Land price escalation is certainly delaying or canceling some projects in Seattle, but savvy local owners who can manage versatile product types will continue to purchase land and move forward with development. Many are exploring submarkets like Bothell, Shoreline, Tukwila and Tacoma. Likewise, with the progressive increase in allowed heights for new development in many Seattle neighborhoods, we’re finding that more SEDU (small efficiency dwelling unit) projects pencil and will be built.